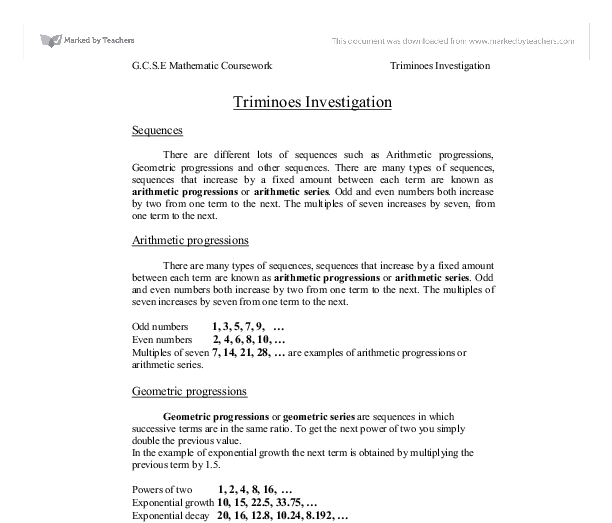 There are different lots of sequences such as Arithmetic progressions, Geometric progressions and other sequences. There are many types of sequences, sequences that increase by a fixed amount between each term are known as arithmetic progressions or arithmetic series. Odd and even numbers both increase by two from one term to the next. The multiples of seven increases by seven, from one term to the next. There are many types of sequences, sequences that increase by a fixed amount between each term are known as arithmetic progressions or arithmetic series. Odd and even numbers both increase by two from one term to the next. The multiples of seven increases by seven from one term to the next. Multiples of seven 7, 14, 21, 28, … are examples of arithmetic progressions or arithmetic series. Geometric progressions or geometric series are sequences in which successive terms are in the same ratio. To get the next power of two you simply double the previous value. In the example of exponential growth the next term is obtained by multiplying the previous term by 1.5. I am doing this to eliminate c from the two equations, to create an equation. I am doing this to cancel out b and find the value of a.
I am going to Substitute a = 1/6 into equation . I’m doing this because to find what “b” is worth when substituting a = 1/6 into equation 9. Substitute a = 1/6, b = 1 into equation 6. I’m doing this because to find what “c” is worth when substituting a = 2, b = 3 into equation 6. I am going to Substitute a = 1/6, b = 1 and c = 11/6 into equation 1. I’m doing this because to find what “d” is worth and also that leads me to working out the formula for the area of the triangle. 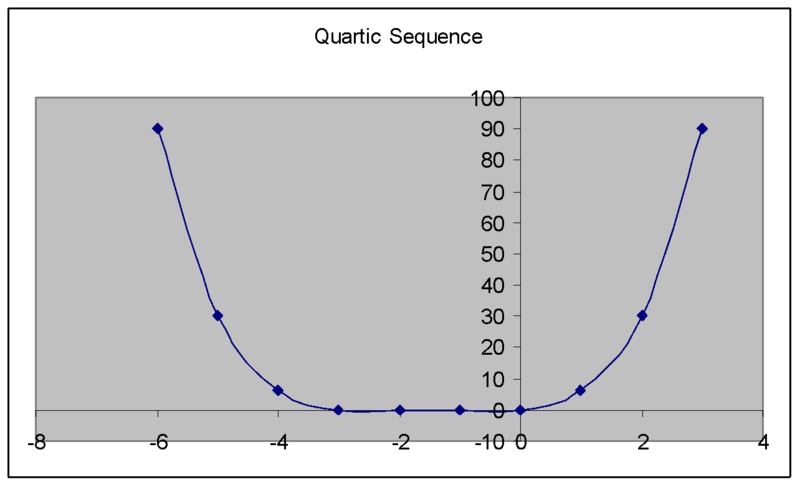 I am going to Substitute a = 1/6, b = 1, c =11/6 and d = 1 put into the quadratic sequence. I am going to find the value of the negative number so I could see how it goes in the graph. Using the results I have created a table which will be much easier to see and to plot the points in the graph “f(n) = 1/4n (n³ + 6n² + 11n + 6)”. 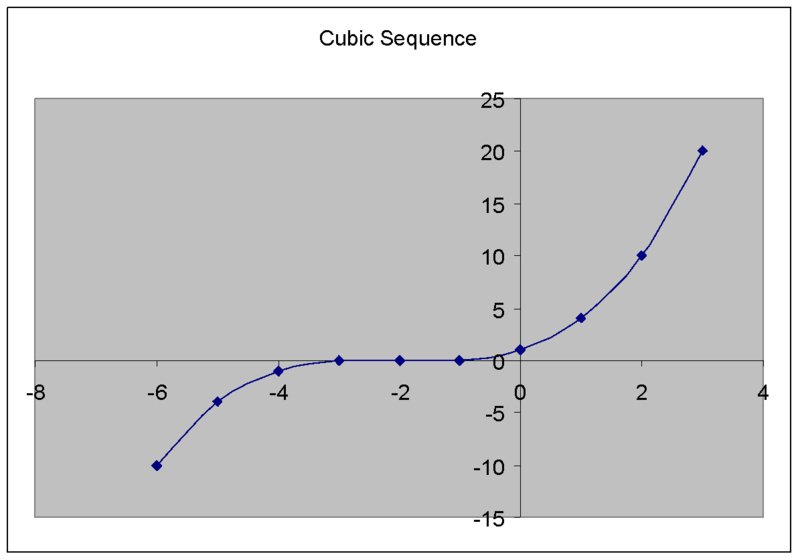 This graph is for the Cubic formula. This graph is for the Quartic formula. that both of the formulas ends up with the same numbers and letters inside the brackets. up by 4 and the second number follows the 9 times table. F=First number S=Second number W Formula F S 4 7H-18 7 18 5 11H-27 11 27 6 15H-36 15 36 Again the same equation is used as there are 2 layers to the first number. Pos.in seq. 1 2 3 4 5 6 No.of squar. (c) 1 5 13 25 41 61 1st differ. (a+b) 0 4 8 12 16 20 2nd differ. (2a) 4 4 4 4 4 We can now use the equation an2 + bn + c 'n' indicating the position in the sequence. and the turtle will draw out the fractal by drawing its trail. 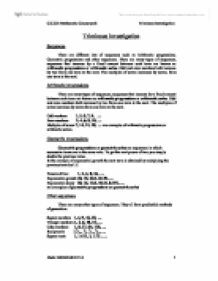 To see a Netlogo-based L-system generator, go to: http://ccl.northwestern.edu/netlogo/models/run.cgi?L-SystemFractals.722.481 . Another field in fractals research is the theory of fractal dimensions. We know that the first dimension consists of a line, the second consists of a plane, and the third consists of a cube.